Peppermint White Chocolate Popcorn Mix is a refreshing snack mix for Family Movie Night. I’m all about Christmas movies pretty much all year long. But from Thanksgiving on, it’s nonstop Christmas movies 24/7 at my place. Well from after work until bedtime and the weekends, but you know what I mean. 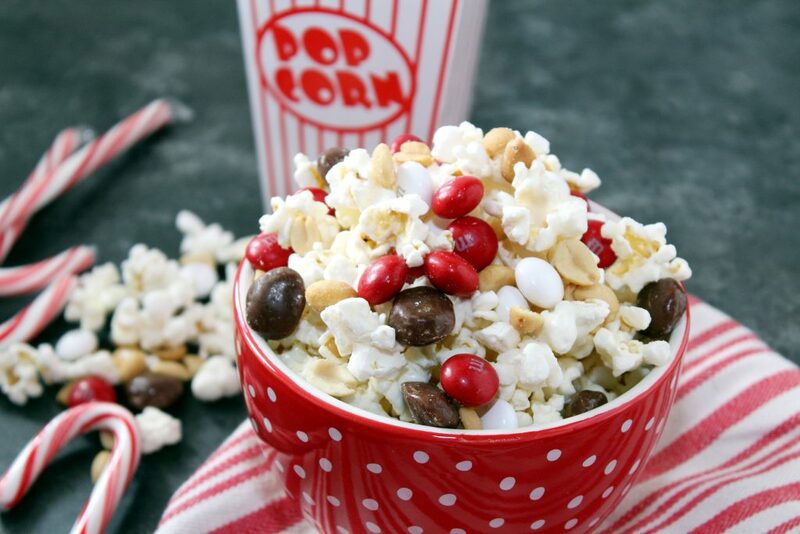 This Peppermint White Chocolate Popcorn Mix is perfect for watching all your favorite movies. My favorite treat while watching movies is popcorn with milk duds. Oh man I love going into the bucket not knowing if you’re getting popcorn or milk duds. Then I tried some Raspberry White Chocolate Popcorn and my life has never been the same. It was like eating candy in popcorn form. Now I can’t eat it all the time, but for a special treat, like watching Christmas movies, this is my special treat. Because of the season, I made it with peppermint extract. It’s a refreshing taste and I like it. I’ve added peanuts for the salty part and peppermint M&Ms just to add some color and more flavor. You can’t skip the Milk Duds. Just trust me. Microwave popcorn according to package instructions. Remove unpopped kernels and spread popcorn out on a parchment covered jellyroll pan. Place chocolate chips, peppermint extract and shortening in a microwave safe bowl. Heat in :30 second increments until melted, stirring after each segment. If chocolate seizes up on you, add a tiny bit of shortening and heat for :10 seconds to melt. Mix until melted. 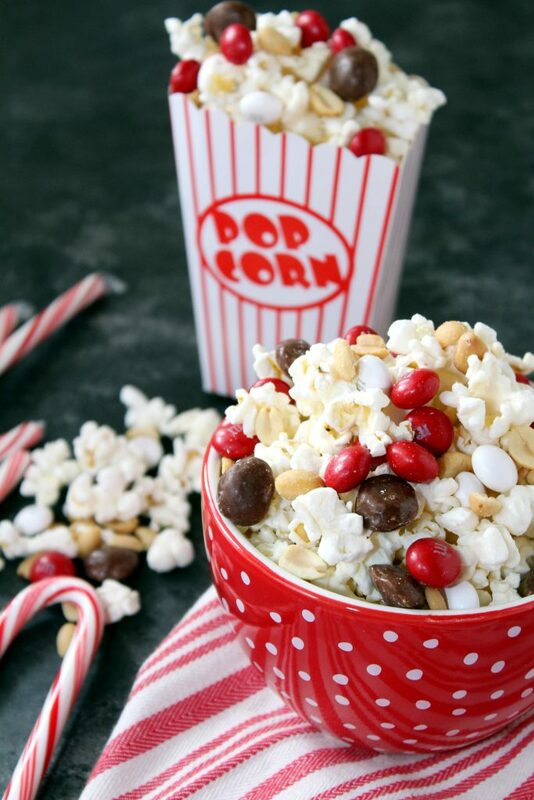 Drizzle melted chocolate over popcorn then toss to combine. Let set for 1 hour. Place popcorn in a large bowl and toss in peanuts, Milk Duds and M&Ms.